File photograph of SCP-051 in operation. Special Containment Procedures: SCP-051 is to be kept in the secure section of Site-██'s motor pool. All access to SCP-051 is restricted to personnel with Level 4 clearance or personnel responsible for SCP-051's maintenance. Any unauthorized use of SCP-051 will be met with severe punitive measures. 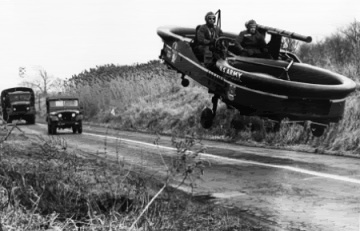 Description: SCP-051 can best be described as a "flying jeep", even though it does not use the same chassis or design, nor was it made by any jeep manufacturer. SCP-051 was a secret Allied World War II weapons project exploring the use of short range flying vehicles. Because all pertinent files of SCP-051 have either been lost or destroyed since its creation, very little is known about SCP-051's history, and whether it had any impact in World War II. It is theorized that ███████████ ███████ Labs was responsible for the creation of SCP-051 due to recently recovered data that refers to their World War II projects. However, due to the destruction of ███████████ ███████ Labs as well as the disappearance or death of the original design team, such theories are impossible to confirm at this time. Through intense study of SCP-051's construction and mechanical parts, Foundation engineers have determined that SCP-051 is capable of achieving flight as well as operate as a normal ground-based vehicle and can carry up to 318 kg, though it is quite possible to load up to 590 kg if needed. Flight testing has also shown that SCP-051 has a top speed of 220 km/h and a service ceiling of 1000 m. However, even with thorough analysis, Foundation engineers have been unable to determine the exact nature of the mechanisms that allow SCP-051 to achieve flight. What is known, though, is that said mechanisms are powered by a standard internal combustion engine. The engine itself is not required for flight, though. The SCP-051's original World War II-era engine had been replaced with a more modern engine without any detriment to SCP-051's performance. SCP-051 also does not need any special power source other than what its engine requires. Currently, SCP-051 is running off a diesel engine that can be powered by a range of fuels, including standard diesel gasoline, biofuel, and refined cooking oil. There are currently projects to make SCP-051 more environmentally friendly through the use of fuel cells, solar power, and electric batteries. SCP-051 initially came to the Foundation's attention in 19██ when a World War II archivist came across photographs of SCP-051 in operation and began distributing them to colleagues. Agents managed to intercept the photos and convince the parties involved that SCP-051 was an elaborate hoax. However, analysis of the photos revealed that the photographs were completely genuine. SCP-051's existence was soon corroborated when sightings of a "flying jeep" began to surface in ████████, ██████. Further details on the recovery of SCP-051 can be found in Incident Report 051a. Addendum 1: Since SCP-051 has been taken to Site-██, UFO sightings from the surrounding areas have increased by 500%. The matter is currently under investigation. Addendum 2: As of ██/██/20██, security measures around SCP-051 have been increased and access has been restricted to Level 4 personnel only. For the last time, SCP-051 is not to be used for recreational purposes! If I catch anybody else joyriding on it, it's Keter duty for the whole Site! - O5-██. Addendum 3: Recent declassification of Nazi documents reveal a psychiatric evaluation of the remnants of an SS battalion who claimed that they had fallen under attack by several dozen "flying jeeps". The implications that there may be multiple copies of SCP-051 in existence must now be taken seriously.